henry has adorable, tiny hands, like all babies. and i’m sentimental and want to remember them forever. i was thisclose to buying one of those handprint ornament kits from the store but then i heard about salt dough. seemed easy, and i had all the ingredients so i tried it out. and easy it was. the hardest part was getting henry to keep his hand spread out while not grabbing the dough. first make your salt dough. mix together until fully incorporated. knead dough for 7-10 minutes, or until soft and smooth. roll out to your desired thickness on a floured surface, mine was about a quarter-inch. create your ornaments, poke a hole in each for hanging (with a straw or skewer) and either bake in a 200 degree oven for a couple of hours or air dry a few days until dry. once painted (or not), spray with a couple of coats of poly to seal and help it last. i pressed henry’s hand in the dough before cutting out – it was a bigger target for his wriggling hand. 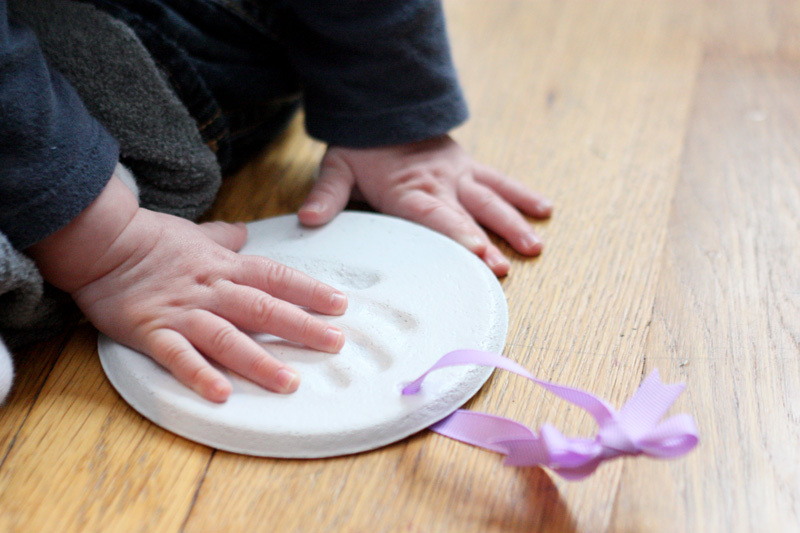 after i used a bowl to cut a circle around his handprint. then before baking i stamped his name in the dough – one time with ink, one time without (i made two in case). after baking the ink was completely visible (which means it works), however, i didn’t like my execution of it. but you can leave all the decorations until after drying, the dough takes paints well. after quickly sanding rough edges (i wasn’t very clean with my cutting) i spray painted the entire ornament white, then painted the stamped letters with gold rub ‘n buff. 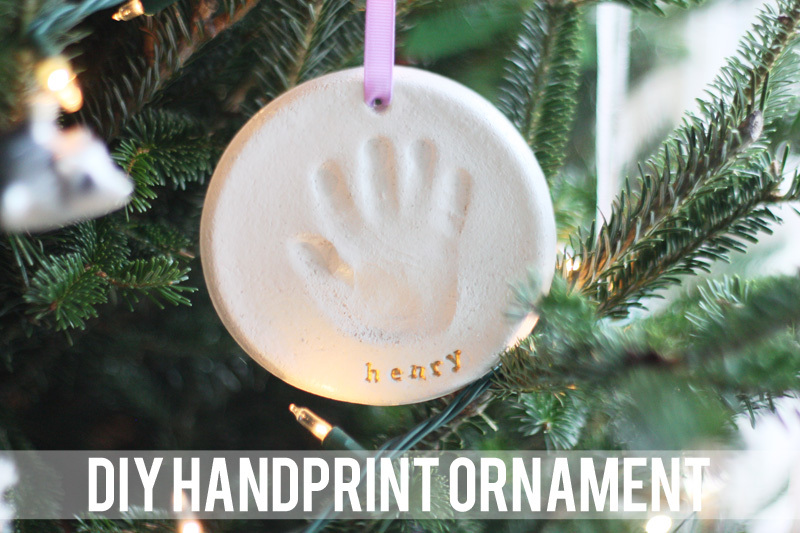 perfect for a last-minute gift for the grandparents or to hang on your own tree to remember those itty bitty hands. are you ready for christmas? i have just a couple small gifts to get still (ugh, i hate being this last-minute, and i don’t know when i’ll get to them) and just a couple small ones to wrap. i. am. so. excited! These turned out adorable. I love that you painted it white, too. 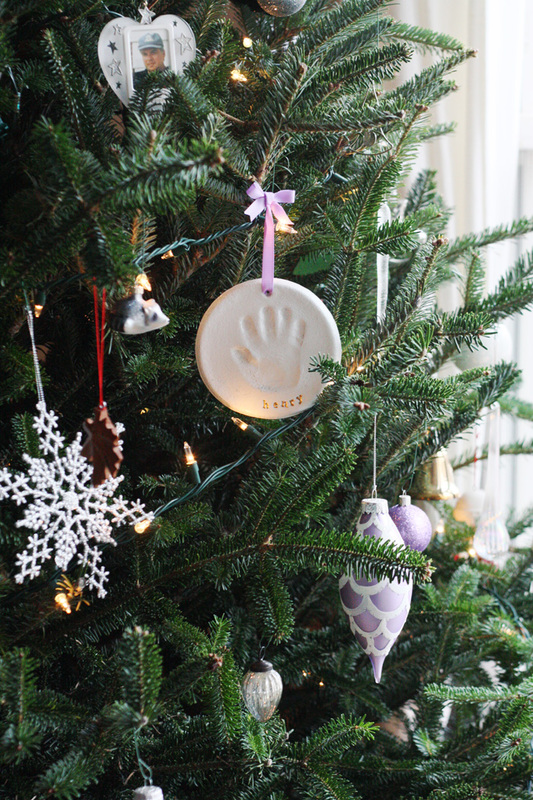 We made little handprints with paint on round ornaments a few weeks ago for the grandparents but now I think I may need to make these, too. 🙂 thanks for the tips. these ornaments are very well done…. 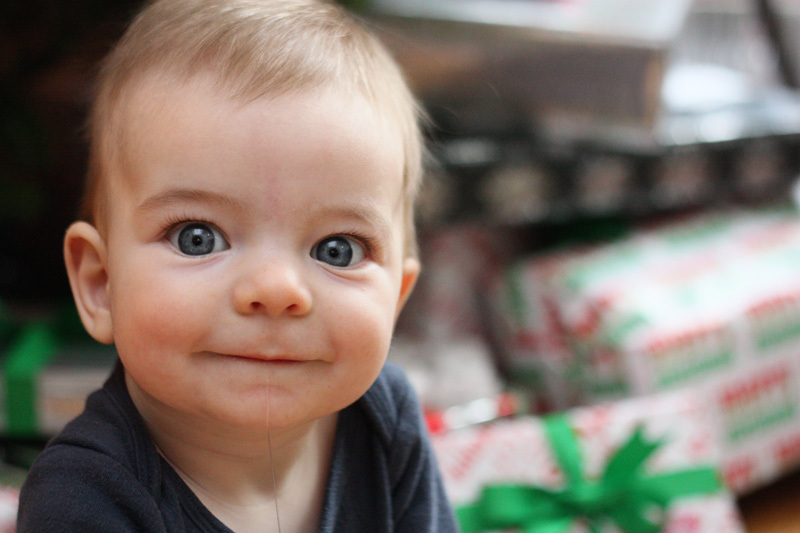 appreciate the baby pics – just an added bonus – have a very merry Christmas and enjoy henry while he is a baby – time is fleeting. What stamps did you use for his name? Super cute! thanks,mary! i got the stamps a while ago most likely from either hobby lobby or joann fabrics; they are the the brand creative cafe. How did it hold up over the year? And do you think a sticker would stay on it or should I press it in before it dries? I was thinking of making it with my pre-k class. ashley, i have yet to unpack my christmas stuff — i’m stuck on ‘tradition’ and will wait until the day after thanksgiving to get my tree and start decorating. so, i can’t answer how it’s held up, yet. i will do my best to remember to update once i do! as for the sticker, i think that you will need to secure it on by spraying the ornament with a polycrylic spray after you placed the sticker on (but that’s just my guess, i haven’t tried). please let me know how it goes if you do! What kind of ink did you use? i just used regular stamp ink! I know this is an older thread but I have a question… I tried the stamping and it didn’t show up. Do you think it’s so visible from doing the stamp first and then baking? The letters in the picture almost look indented? Thanks for your help! Hi. I had used the stamp to indent the letters into the dough, then I painted after. Hope this helps! Going to try this ornament today with my great granddaughter Delilah! She is 4 months old & it will be a Christmas keepsake. Thanks for the directions. I really want to try this with my son who is 6 weeks old but what spray did you use to help seal it? bree, mod podge makes something labeled “acrylic sealer”, in a spray can (and probably other brands). i found it at michael’s. How did the dough hold up? Im going to make this for my daughter and the grandparents…. I just want the dough to last! it held up well! i just took it out of storage and hung it on my tree – his hand now is like twice the size! crazy. there is a slight crack in it, but truthfully i never took my own advice and didn’t seal it. can you freeze the dough and use the next day? i like to have things made ahead of time, so its ready when i wanna use it. nicole, i have never tried. i don’t see why not, in an airtight container, but i don’t have experience doing it so i don’t want to steer you wrong. sorry! 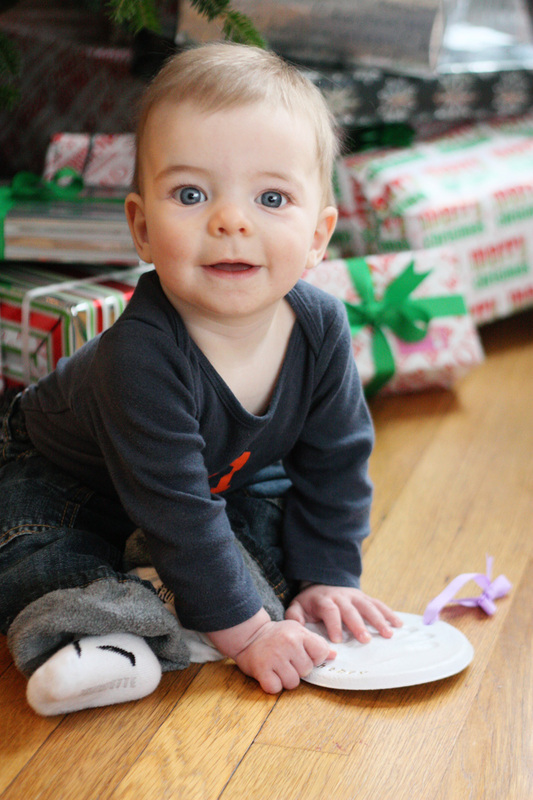 I know this is a year old, but I wanted to let you know that these are probably some of the best done ornaments I found, and your son is too stinking cute! 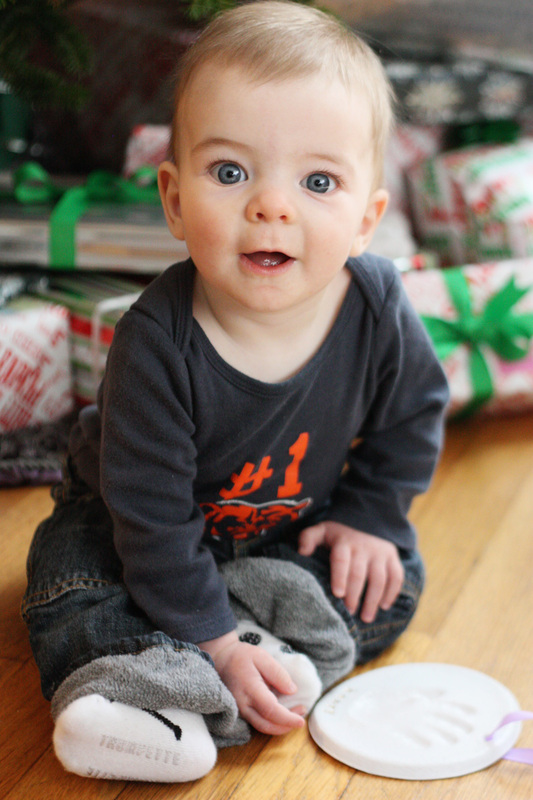 Adorable little Henry! Love this idea! Thanks! Pinned it! Merry Christmas! thank you for letting me know it turned out great, i’m glad it worked out for you. 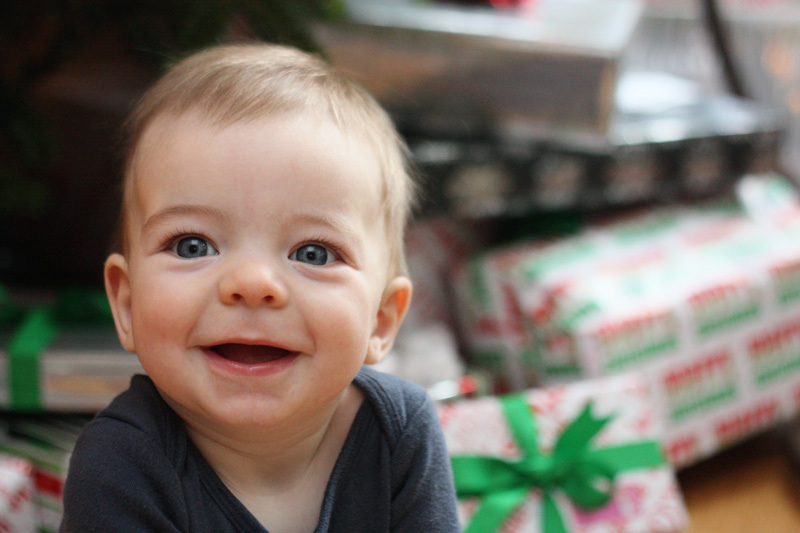 have a wonderful christmas with your three kiddos. Did you use all purpose or self rising flour? We just tried to make some however they are baking too fast and are bubbling up. I love this! And I love how the name looks so perfect. I’m not familiar with using stamps. You mean like ink stamps or like engraved type stamps? I’m not sure what to look for when going to hobby lobby! i used stamps that were meant for ink pads – they were just a set of tiny letters i found for cheap. thanks for visiting! I was just wondering with the recipe you have, how many ornaments were you able to make? I’m a preschool teacher and I’m thinking I’ll have to at least double or even triple the recipe for my 14 toddlers. it made two of the bigger round ornaments (the diameter of a cereal bowl, as that’s what i cut it with), and with the scraps i shaped them into the smaller ornaments shown (the small circle and the h). if you roll it thinner you could get another probably, but you don’t want to go too thin. so for a big group like that i would probably quadruple it (or more to be safe). you are welcome! good luck with the wiggly hands 😉 you will love looking back on it and seeing how small her hand was – just a year later for me and it’s crazy how much it’s grown! thanks for the tip on the stamps. once you put them in the oven did they shrink at all and did they lose any weight? i just made them but i’m debating on letting them dry for a couple of days of sticking them in the oven. i’m too impatient and they’re so adorable. i had each of my three boys make one and they seem a bit heavy. they did not really shrink or lose weight in the oven. they are a heavier ornament, but it also depends on how thin it’s rolled and how big it ended up. glad you like them! how many hours do I keep them in the oven? it depends on how big and thick, but i would start with two…it could take another hour or two though. i think mine was in there for 2-3 hours and then i left it on the counter overnight to completely finish drying the big ones. 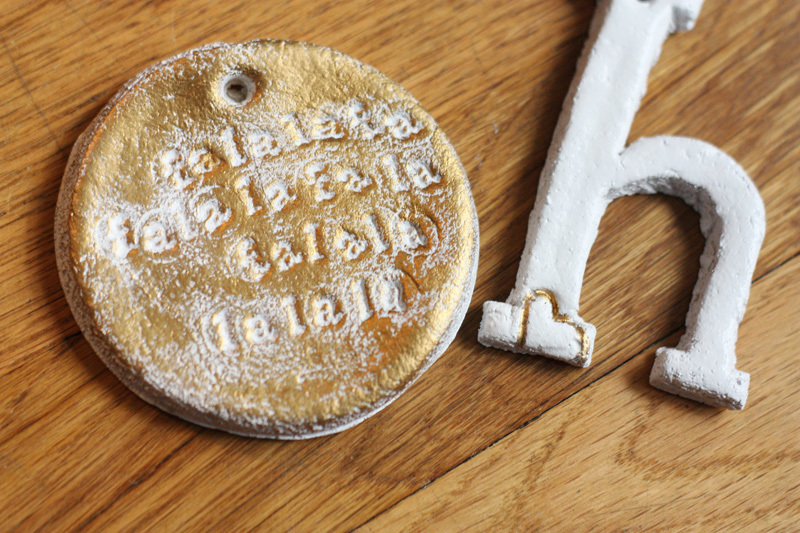 How did you paint the letters gold after spray painting the ornament white? I stamped the letters gold before baking, but I just realized that the white paint will cover that up. I read that you used rub n buff, which I’m not familiar with. Did you just rub that in the letters and then wipe off? Any suggestions? What kind of white paint did you use? An acrylic? i used spray paint, though i’m sure an acrylic would work too (but spray paint is quite fast). I have tried a lot of these salt dough recipes and this is by far the easiest to work with! We do this a few times a year and now that my son is 3 and his hands are massive it’s bittersweet to lay them all out. I’m really glad this is a tradition of ours. I’ll be forcing a 12 year olds hand into dough one day I’m sure of it but for now he is super happy to help. Thanks for sharing this recipe and the adorable pics of your son. Merry Christmas! so glad you enjoyed this recipe. love that you do this so often and can see the growth – i have yet to do another one (though i will eventually), but love holding his hand up to it to see how much he has grown. merry christmas to you! Love this!!! Do you put it on a baking sheet when baking or straight in oven?? I also wanted to know in order to seal it, can a satin acrylic varnish be applied?? I paint with acrylics so I have this at the house already…just curious?? i would think so, i don’t see why not! though i haven’t tried myself. Coat. And I baked them in the oven, so the salt dough was dry, I was just letting each coat of spray dry. oh no! i’m so sorry to hear. i haven’t had that happen to me, so unfortunately i’m not positive. perhaps the sealant was water based and the spray paint you used was oil based? or vice versa? i hope the rest turned out! i’m so glad, merry christmas! I just made these with my 3 year old and they turned out SO cute! I didn’t stamp his name in, I have pretty decent handwriting, so I’m just going to write his name and the year on it and then seal them. They’re going to be presents for the Gma’s 🙂 Thanks for the great post! i’m so glad! thank you for letting me know 🙂 i’m sure the grandparents will LOVE them! merry christmas! It couldn’t hurt to bake them some more if they never firmed up. Glad you enjoyed the project! Hi- I was going to try and make these with my 7 month old this week. Just a run down in what you did- Make the salt dough, stamp hand or foot and name, bake, spray paint white, paint letters and then seal with the acrylic spray? Just making sure I had my steps right. Thanks! You got it! (tiny step – I did cut the salt dough into the circle shape after I did the hand/foot impression – larger area to work with before). Have fun! Thank you! Is it best to knead by hand or can you use a stand mixer with the dough hook attachment? Love this !!! My son is 3 1/2 months and we just made one! ❤ Thank you for the intructions- This is such a sweet and inexpensive keepsake for the grandies!!! I’m so glad you like it! I’m sure the grandparents will too. That would be a great project for them! I have not tried to air dry the ornament before, so unfortunately I couldn’t tell you for sure. I would guess at least a couple days? Wax paper would be the best bet on what to dry them on. If you could, let me know how long it takes to air dry so I know, thanks! I tried these today, but after putting them in the oven, the ornament rose and you can barely see the prints. Any idea what to do so it doesn’t happen next time? Hi, Julia. Unfortunately I haven’t had this happen to me the two times I’ve made them. Perhaps your dough needs to be rolled a little thicker, so the impressions can be deeper? I just made one ornament with a 3 month old! My friend’s 1st Mother’s Day. The tiniest handprint ever and I hope it comes out of the oven the way I want and I’m dying! I searched and searched for a recipe and a site I thought was helpful, joyful and warm. Thank you for a great post. I hope to read more! Can you seal the ornament with clear polyurethane spray? Your’s turned out so cute by the way. Yes, of course! I should have but didn’t – though it’s held up fine so far. Do you know how to repair a hand print that has broken? Is it even possible? Hi wanted to try this with the kids later on but can I use self rising flour or does it have to be all purpose? Before our dog passed away we made salt dough imprints of his paw and we let them air dry but almost all of them cracked 😦 how would we be able to repair them? Please help! Justine I just made one with my 1 1/2 year old and my almost 2 month old today I did one of my 2 month olds hand and foot… They turned out perfect. I love making these. I made ornaments with cookie cutters and put glitter on them about 2 years ago with my two daughters and husband and they loved it. Hey! I know this is years after you posted this, but I just wanted to let you know I’m about to do this for my third kid. The first two have held up over the years (3&5 years old!) Thank you for an awesome keepsake idea.